Biosensors & Bioelectronics has an open access mirror journal Biosensors & Bioelectronics: X, sharing the same aims and scope, editorial team, submission system and rigorous peer review. Biosensors are defined as analytical devices incorporating a biological material, a biologically derived material or a biomimic intimately associated with or integrated within a physicochemical transducer or transducing microsystem, which may be optical, electrochemical, thermometric, piezoelectric, magnetic or micromechanical (Turner et al., 1987; Turner, 1989). Biosensors & Bioelectronics is the principal international journal devoted to research, design, development and application of biosensors and bioelectronics. It is an interdisciplinary journal serving professionals with an interest in the exploitation of biological materials and designs in novel diagnostic and electronic devices including sensors, DNA chips, electronic noses, lab-on-a-chip and μ-TAS. Biosensors usually yield a digital electronic signal which is proportional to the concentration of a specific analyte or group of analytes. While the signal may in principle be continuous, devices can be configured to yield single measurements to meet specific market requirements. Examples of Biosensors include immunosensors, enzyme-based biosensors, organism- and whole cell-based biosensors. They have been applied to a wide variety of analytical problems including uses in medicine, biomedical research, drug discovery, the environment, food, process industries, security and defence. The design and study of molecular and supramolecular structures with molecular biorecognition and biomimetic properties for use in analytical devices is also included within the scope of the journal. Here the focus is on the complementary intersection between molecular recognition, nanotechnology, molecular imprinting and supramolecular chemistry to improve the analytical performance and robustness of devices. The emerging field of Bioelectronics seeks to exploit biology in conjunction with electronics in a wider context encompassing, for example, biological fuel cells, bionics and biomaterials for information processing, information storage, electronic components and actuators. A key aspect is the interface between biological materials and micro- and nano-electronics. 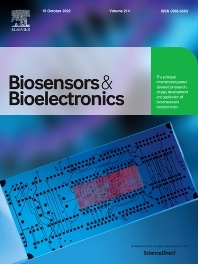 While endeavouring to maintain coherence in the scope of the journal, the editors will accept reviews and papers of obvious relevance to the community, which describe important new concepts, underpin understanding of the field or provide important insights into the practical application, manufacture and commercialisation of biosensors and bioelectronics.